Choosing the best Forex trading platform can be a challenging task for beginners. Selecting the most suitable, easy to use, and intuitive platform may impact your trading strategy and your profits generation potential. The most well-known and popular Forex brokers have developed their own platforms, however, they offer several options to meet the investors’ preferences. Don't feel Like reading? Watch the Video instead! MetaTrader 4 has been used since 2005 by most forex brokers and forex traders. It could be considered the gold standard forex trading platform. MetaTrader 4 allows its users to perform technical analyzes, watch the market, recognize trading signals, and program automatic trading to avoid missing any market investment opportunity. The rather simple interface and the free educational material available on the internet make MT4 one of the best forex trading platform for beginners. The MT4 interface is as simple as it can be. Any new fx trader can learn how to use it in less than 5 minutes. MT4 is preloaded with the most widely used indicators, oscillators, and price charts for the fx trader, to select them, just by right-clicking over them. The great variety of technical tools cover the most trading strategies and they are arranged in an alphabetical order to simplify its navigation. The trading buttons are easy to use with permanent real-time buying and selling price quotes updates during the market operational hours. The Fx traders have complete control over the order’s placement, the only limitations are those imposed by the selected forex broker. Most forex broker around the globe either use MetaTrader 4 or have supporting bridging applications to integrated it into their trading software platform. MT4 can be downloaded for free either from the forex broker website or the Metaquote software website. It can be used on any PC or Mac computer. MetaTrader 4 has fully integrated and the most popular and widely used forex indicators and oscillators, which can be added or removed to any price chart in seconds. More indicator free and paid can be download via the Metaquote website. The great amount of free trading teaching materials developed by the top forex traders to improve your trading strategy or teach the fundamentals and basics of forex trading. You can find hundreds of videos, tutorials and explanatory text on the internet describing how to use MT4 and how to implement your trading strategy on it. The software displays can be customized and fx traders can select their trading currency pairs, price charts, trading signals, expiration time, markets, etc. Custom indicators, the MT4 allows the creation of new indicators and technical analytical tools by any user. MT4 application can be downloaded and deployed from any Android or IOS compatible smartphone device to keep an eye on the market or place orders on the go. SMS and email alerts, you won’t miss any market signals or a price momentum opportunity after setting your trading and signals alerts. MT4 will send you an email and an SMS to your cell phone every time the market moves in a preset direction or reaches a preset value. The alerts feature might prevent any unexpected price movement markedly impacts your strategy. The displays can open four different price charts simultaneously and lets you trade on each of them independently. Copy trading is a fantastic option for beginners that lets you see what other professional traders are doing or how they are investing and the profits they have generated. After you evaluated any of the top traders you can start copying their trades, market moves and apply the same strategy adapted to your investment level and your preset trading conditions. cTrader was developed by Spotware.inc and released in April 2016. It is considered a third generation trading platform, which was designed to deliver the largest amount of forex market data to fx traders in just seconds allowing a fast market entry and orders execution. Moreover, the cTrader’s developers considered the mobility capacity and efficiency needed by worldwide forex traders creating a charting market information delivery system, which speeds up the order placement with virtually no waiting time to avoid any possible market variation. The cTrader trading platform is easy to use and very intuitive as you may expect for any post MT4 software development. cTrader simplifies the entire trading process for fx traders and fx brokers. The displays are fully customized and were designed with the trader needs in mind. It offers amazing state of the art charting tools and includes the technical tools needed to implement any trading strategy. The large amounts of data from financial markets are oriented to improve the fx traders’ risk management plan and helping them to adhere to their investment or trading strategy. cTrader is a web-based platform that allows traders to transform any internet connected compatible computer into a sophisticated trading station. Fx Traders can access and manage their trading account from any place at any moment after successfully logged in. Speedy order placement, fx traders can fill and place their orders in just milliseconds, there is no limit to the number of simultaneous order that they can process with the software “no order queue” feature. cTrader shows the Volume Weighted Average Price (VWAP), which is a second level price sub-system that lets you know the current range of executable prices disclosing the order book recorded transactions. Traders can select their trigger methods for Stop Loss and Take Profits, decreasing the negative outcome or financial loss from erroneous market signals interpretations. Quick trade is similar to one-click trade, which allows traders to open, modify or close any position in just seconds when the market is experiencing high volatility or it is moving faster than usual. cTrader Tooltips informs the cost, commission, margin required, current value and pips of your current order volume, centralizing in a single displayed window the trading conditions for each forex investment instrument. Symbol info provides the market hours, lot sizes and any critical information for the available forex instruments. cTrader Market sentiment is an innovative real-time indicator of the percentages of traders across the different supported forex brokers that expect the exchange rate for a particular currency pair to fall or rise. The market sentiment might give you an insight of the forex traders expected price moving direction of any exchange rate and how they are investing. Email Alerts allow traders to maintain a watchful eye on the currency market and be informed when any preset exchange rate or market condition is met. The email alerts reduce the response time and increase the profit generation potential. cTrader Copy lets any trader copy the investment strategy from fx traders participants. 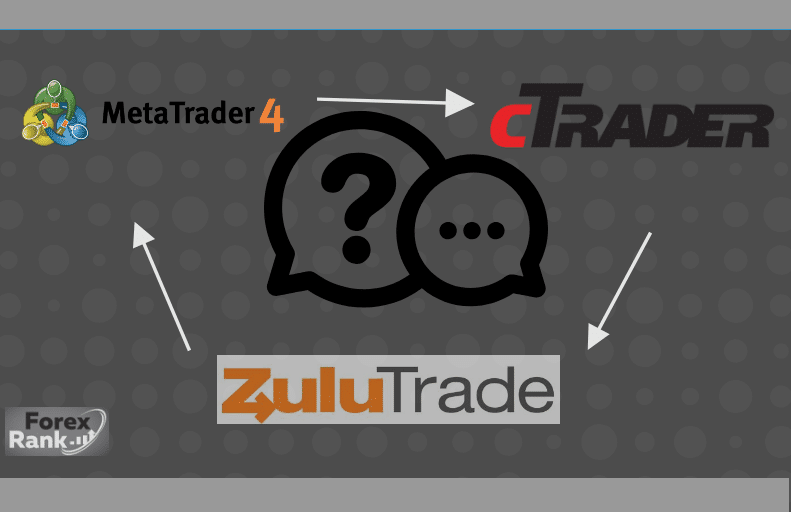 ZuluTrade was developed in 2007 after the new age of social networking. Its main characteristic is the development of the social trading concept. Social trading allows the platform users to see and copy what other traders are doing and how they are investing. Any fx trader can mimic or imitates the entire trading strategy or any part of it from a more experienced and successful forex trader. The possibility to copy from expert forex traders may increase the winning rate and revenue for new investors or beginners. In deep, this feature is evaluated as the best financial advice and trading tip anybody could get making ZuluTrade one of the best forex trading platforms for beginners. The ZuluTrade platform is easy to use, any new user can learn how to see what other certified top forex traders are doing, how they are investing their money, and the revenue they are getting from it. The interface is pretty straightforward, the traders can select to start or stop following and copy someone’s strategy at any moment free of charge. Additionally, traders can chat with others and exchange trading strategies or choose to not take part in forums and chat-rooms. Signals providers are ranked based on their winning rate, overall profits, and trading strategy success. ZuluGuard is a stop copy feature, which stops following and copying any signals provider that changes his trading strategy. ZuluScript is an automatic trading software or robot that can be programmed or set to automatically copy from a signals provider and place orders or open a market position when the preset parameters are met. The preset parameters or trading criteria can be fully customized and will depend on the fx trader choices, preferences and strategy. The followers can copy the entire portfolio or any portion of it. Additionally, followers can place orders manually after learning what the signals providers are doing. Social trading is always proportional, the ZuluTrade algorithm maintains a percentage or ratio similar for followers, e.g. if a signals provider has 100,000 USD investment’s funds and he trades 25,000 USD on EUR/GBP, any followers will trade only 25% of his investment’s money copying it. Which Platform is your overall “Go-to Platform”? We would love to know so Comment below!